(1) 20 Pin AND (5) IDE Power Connections. W/PFC 20 PIN CONNECTION. 4 PIN IDE CONNECTORS. any claims. We do stand behind our products and will do everything in our. Internal 40mm ball-bearing fan. 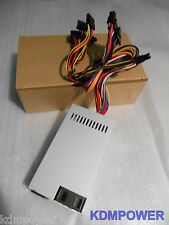 - Mother Board Connector Form Factor 12 Volt Rails - 20 4 pin Connector x 1. -4 Pin Molex -SATA Connectors. Was removed from a 1U rack mount network appliance. ATX 20 Pin. MTBF 100,000 Hours on Maximum Load at 25°C. Output Power. Current 12A 0.5A 13A 13A 12A 0.5A 2.5A. SATA 15 Pin x 2. P4-12V 4 Pin x 1. ATX Connector 24 (20 4) Pin x 1. Output connectors includes 24(20 4)pin, P4-12V 4pin, SATA II 15pin, Molex 4pin. Maximum Power. ATX Connector 24 (20 4) Pin x 1. Designed for the FLEX form factor to provide compact flexibility for small computer cases. Output Power 320W. It includes these output connectors: 24(20 4)pin x 1, P4-12V 4pin x 1, SATA II 15pin x 3, Molex 4pin x 3, and FDD 4pin x 1. 0° C ~ 50° C on Output Load ;. MTBF 100,000 Hours on Maximum Load at 25°C. Connector included: ATX Connector 24 (20 4) Pin X 1, P4-12V 4-Pin X 1,SATA 15-Pin( Right Angle ) X 2, Molex 4-Pin X 2,Floppy 4-Pin X 1. MTBF: >100,000 Hours on Maximum Load at 25°C. Type: Flex ATX. 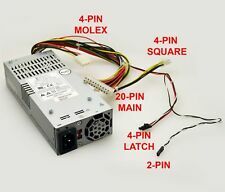 Connector included: ATX Connector 24 (20 4) Pin X 1 PC, P4-12V 4 Pin X 1 PC, SATA 15 Pin X 2PC, Molex 4 Pin X 2 PC, Floppy 4 Pin X 1 PC. Compatible models shown above are for reference purpose only. Support 4x SATA drives as well as legacy IDE devices. Peripheral support: 2x standand 4-pin Molex IDE & 4x newer SATA power connectors. 4 x SATA Power Connectors. 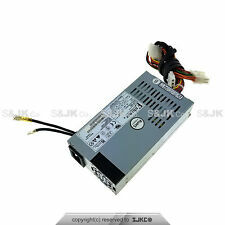 (on 2 separate wires)longest sata length: 455mm. Internal 40mm ball-bearing fan. - Mother Board Connector - 20 4 pin Connector x 1. 12 Volt Rails - Floppy Connector -4 Pin Molex. Short Circuit protection. Over Power protection. Input Frequency Range. Maximum Power. 3.4" x 1.7" x 6". >100,000 Hours. 115 / 230 V.
TFX 12V Compliant. Output capacity is rated at 220W continuous. High Output Current for 5Vsb. Upgrade over ENP-2220A. Short Circuit. Manual select switch Protection. Power Connectors (3) Molex IDE peripheral power connector. MTBF 100,000 Hours on Maximum Load at 25°C. Output Power. Current 14A 0.5A 8A 8A 14A 0.5A 2.5A. SATA 15 Pin x 2. P4-12V 4 Pin x 1. ATX Connector 24 (20 4) Pin x 1. Frequency 60/50 Hz. Internal 40mm ball-bearing fan. - Mother Board Connector Form Factor Current 15A 0.5A 9A 9A 0.8A 15A 2.5A. - 20 4 pin Connector x 1. 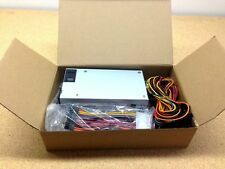 12 Volt Rails -SATA Connectors. MTBF 100,000 Hours on Maximum Load at 25°C. Output Power. Molex 4 Pin x 2. SATA 15 Pin x 2. P4-12V 4 Pin x 1. ATX Connector 24 (20 4) Pin x 1. Current 14A 0.5A 8A 8A 14A 0.5A 2.5A. Internal 40mm ball-bearing fan. - Mother Board Connector 80 Plus Certified Form Factor Current 15A 0.5A 9A 9A 0.8A 15A 2.5A. - 20 4 pin Connector x 1. 12 Volt Rails - Floppy Connector. Output connectors includes 24(20 4)pin, P4-12V 4pin, SATA II 15pin, Molex 4pin, and FDD 4pin. Maximum Power. Designed for the TFX form factor to provide compact flexibility for small computer cases. PFC (Power Factor Correction) technology is standard to provide better efficiency. Enhance Part # ENP-2222A. AC Power Cord is NOT included, however it is compatible with your original power cord. Upgrade or Compatible with: ENP-2220A, ENP-2222B, ENP-2224B and others. ITEM HISTORY, FUNCTIONALITY, OR TESTING STATUS: New Open Box. "THE SALE OF THIS ITEM MAY BE SUBJECT TO REGULATION BY THE U.S. FOOD AND DRUG ADMINISTRATION AND STATE AND LOCAL REGULATORY AGENCIES. Works great. Form Factor - Mother Board Connector - Internal 40mm ball-bearing fan. - 4 pin x 1. - CPU Connector - 20 4 pin Connector x 1. SOLD OVER 95 . 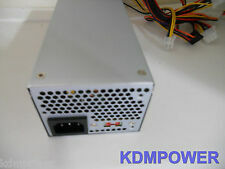 Enhance ENS 0240 - Power Supply - 400 Watt. Enhance ENP-0616B ENP-2320 ENP-2320A ENP-2320B ENP-0616A. DC OUTPUT-Max Load: 200W. Peripheral support: Plenty of standard 4-pin Molex IDE & newer SATA power connectors. 2x SATA (Serial ATA ) power connectors -. 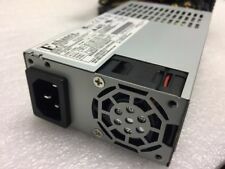 Enhance ENP-7025B 250W Power Supply 1U PFC Flex ATX 80 PLUS Bronze Specification: Output Wattage 250W 80 PLUS Bronze Certified: Power Supply Units (PSUs) that have more than 80% energy efficiency at 20%, 50% and 100% of rated load, and a power factor of 0.9 or greater at 100% load. That is, PSUs that waste 20% or less electric energy as heat at the specified load levels, thus reducing electricity use and bills compared to less efficient PSUs. Form Factor: TFX12V --- Active PFC/CE, UL/CUL Safety Compliant --- Input Voltage: 100-240V 4-2A VAC Auto Sensing --- Frequency: 60-50Hz --- Holdup Time: > 14ms @ Full Load --- MTBF: 100,000 HRS --- DC Output: 3.3V 17A, 5V 13A, 12V 16A, -12V 0. ITEM HAS BEEN USED AND WORKS PERFECTLY WELL.RELATIVELY CLEAN. We will respond promptly to your inquiry. 250W Output, Active PFC. 1x 20/24 Pin ATX Connector. High Efficiency (80 Bronze): 83.56% @ 115Vac, Full Load. Reliability: MTBF 100,000 hrs @ 25ºC, Full Load. ENP-7025B Main Features. Internal 40mm ball-bearing fan. - Mother Board Connector Current 15A 0.5A 9A 9A 0.8A 15A 2.5A. - 20 4 pin Connector x 1. 12 Volt Rails - Floppy Connector -4 Pin Molex. C on 250W Output Load or. C on 250W Output Load ;. ATX Connector. Output Power 250 Watt. MTBF 100,000 Hours on Maximum Load at 25°C. Usage note Certification FCC, UR, CB, CE, Rohs, 80 PLUS. Frequency 60 / 50 Hz. Mother Board Connector - Internal 40mm ball-bearing fan. Form Factor SOLD OVER 50 . 80 Plus Certified 12 Volt Rails - 20 4 pin Connector x 1. Current 15A 0.5A 9A 9A 0.8A 15A 2.5A. Unless otherwise stated, this has been tested for key functionality. This has been tested and it is in good working order. We are otherwise not open to the public. DC Output Spec. Combined Load. C on 220W Output Load ;. ATX Connector. Output Power 220 Watt. C on 250W Output Load or. MTBF 100,000 Hours on Maximum Load at 25°C. Usage note Current 12A 0.5A 12A 0.8A 12A 2.5A. Compatible models shown above are for reference purpose only. Energy Star Efficiency (proven efficiency and safty). Low Noise and Ripple Fan (very quite). Complies with FCC part 15J class B 115Vac Operation and CISPR22 230Vac Operation. 100% Hi-pot & Function (Chroma)tested. 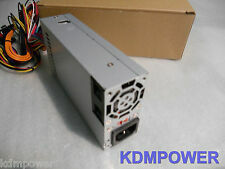 Part Number : 200W. Manufacturer: ENHANCE. We don't have history or type of use of any item. We do not provide technical support for setup, installation or any other user-related issues. Removal of Security Seal will void warranty.